In somewhat of a surprise, after earlier failures to reach an agreement, the U.S. and 11 Pacific Rim nations negotiating the Trans-Pacific Partnership (TPP) trade agreement achieved a preliminary agreement this morning. So maybe now the public will finally get to learn exactly what is in this “secret” agreement before Congress casts an up or down vote on it early next year. The congressional debate over TPP is going to add even more turmoil to an already dysfunctional Congress considering a House leadership election, and GOP government shutdown threats over the Federal debt ceiling, Treasury’s Lew Says Congress Must Raise Debt Limit by November 5, and the long-term budget due on December 11. Several potentially deal-breaking disputes had kept the 12 trade officials talking through the weekend and forced them repeatedly to reschedule the promised Sunday announcement of the deal into the evening and beyond. Final compromises covered commercial protections for drug makers’ advanced medicines, more open markets for dairy products and sugar, and a slow phaseout — over two to three decades — of the tariffs on Japan’s autos sold in North America. Yet the trade agreement almost certainly will encounter stiff opposition. Its full 30-chapter text will not be available for perhaps a month, but labor unions, environmentalists and liberal activists are poised to argue that the agreement favors big business over workers and environmental protection. Long before an accord was reached, it was being condemned by both Mr. Trump, the Republican presidential front-runner, and Senator Bernie Sanders of Vermont, who is challenging Hillary Rodham Clinton for the Democrats’ nomination. I’m telling you, folks, if you think Donald Trump’s demagoguery on immigration has created problems for Republicans, just wait until he unveils his next act. If we get a Trans Pacific Partnership trade deal, Trump may well roll out a whole new story about how Republicans and Democrats alike are conspiring with a shadowy cabal of international elites to help China and other foreign countries continue destroying the living standards of American workers. Even if agreement is reached this week, Congress will not debate and vote on it until late winter — in the heat of the states’ presidential nominating contests — because by law Mr. Obama cannot sign the deal without giving lawmakers 90 days’ notice. …it is the rhetoric of Mr. Trump, given his celebrity appeal, that has Republican leaders more worried that a toxic trade debate could threaten vulnerable Republicans in 2016. 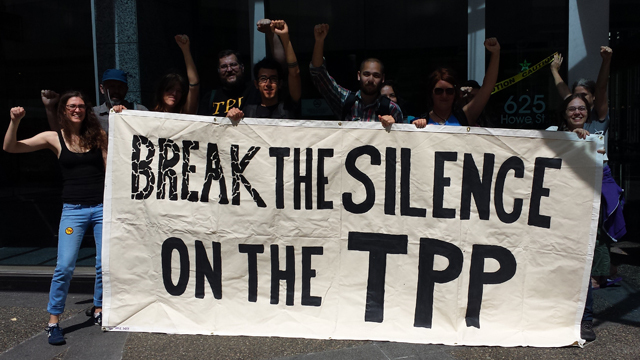 The TPP may be debated in Congress precisely when the voting is fully underway in the GOP presidential primaries. And Republican leaders are worried that Trump’s rhetoric against “free trade” will create complications for the party’s Senate incumbents, who would presumably want to vote to pass the deal. But that’s not all: the TPP could also provide Trump with a weapon to wield against his GOP rivals. Jeb Bush and Marco Rubio support it. By contrast, Trump has railed against the TPP by warning that China will be given back-door access to the deal, further enabling China’s ongoing ripoff of American workers, and against international “free trade” deals in general by claiming we are being “defrauded” by other countries. Who will these voters listen to on the Trans Pacific Partnership — Jeb Bush, who is trying to talk in reasonable tones about the virtues of lowering international trade barriers, or billionaire Trump, who is warning that foreign elites are looking to rip off American workers even more than they have done already? Sen. Bernie Sanders (I-Vt.) labeled a new trade deal finalized by the Obama administration on Monday as “disastrous,” and said he would work to defeat it. “Wall Street and other big corporations have won again,” Sanders said. “In the Senate, I will do all that I can to defeat this agreement,” he said. The New York Times reports that “Mrs. Clinton, who as secretary of state promoted the trade talks, has expressed enough wariness as she has campaigned among unions and other audiences on the left that her support is now in doubt.” Clinton will now have to take a position on TPP. Still, in Congress the outcome for ratifying the agreement “will be affected by what’s in it, and that’s the way it should be,” said Representative Sander Levin of Michigan in an interview here before the deal came together. He was the one lawmaker to come to Atlanta to monitor final talks. Mr. Levin, the ranking Democrat on the House Ways and Means Committee, which has jurisdiction for trade, has supported some trade pacts but was skeptical of this one. He is concerned about unfair competition from Japan for his state’s automakers and union workers. In particular, Mr. Levin objected that language addressing Japan’s devaluation of its currency, which reduces the cost of its auto exports, would not be in the trade agreement but rather in a side agreement that would be hard to enforce against currency scofflaws. Senate Majority Leader Mitch McConnell (R-Ky.) warned Monday that Congress will give “intense scrutiny” to the Trans-Pacific Partnership (TPP) after negotiators reached a historic deal. Under fast-track trade legislation passed earlier this year, Obama’s trade deals can be passed through Congress with a simple up-or-down vote. Lawmakers also aren’t able to amend the trade agreements. So who would have thought that we would be spending our holiday season into early next year debating trade policy and what is in the TPP? This will be an epic fight.